As part of my partnership with Carrabba's Italian Grill, I received a complimentary meal for this review. As always all my opinions are my own. Carrabba's Italian Grill is a restaurant that holds a very special place in my heart. I worked at the Daytona Beach location many years ago when I was 18 years old. My former roommate met her now husband at Carrabba's and in January of 2010, I went on my first date with my husband Gabe at.....you guessed it - Carrabba's. Whenever I'm home visiting friends and family, we tend to go to Carrabba's for a girls night out. The food and drink are always reliable and we love the familiar atmosphere. When I heard Carrabba's changed their menu and took a contemporary approach with the New School of Italian, I was excited and a little scared at the same time. Gabe and I had the opportunity to check out the new Carrabba's menu at the South Tampa location. If you are a Carrabba's enthusiast, you will notice a difference. There are 20 new and innovative scratch-made menu items. However, those classic dishes we all love about Carrabba's are still there. Appetizers have changed a bit and are now more contemporary (never fear, Calamari is still here). Carrabba's also offers small plates, think Italian Tapas style. Our very sweet server Emmy walked us through the new menu and made some suggestions to help our decision process. The first thing Emmy suggested was the Tomato Caprese with Fresh Burrata. I am a huge fan of Burrata and was very excited to see this offering on the new Carrabbas menu. I strongly suggest anyone who visits Carrabba's to order this starter without hesitation. Creamy burrata mozzarella, tomatoes, fresh basil, red onions, balsamic glaze, drizzled with extra-virgin olive oil. It was the perfect starter. Chicken wings at Carrbba's....huh? We thought it and I know you are currently thinking it. However, be glad they are on the menu. The Wood-Fired Italian Wings are perfectly seasoned and very crispy. They are seasoned with spicy Italian chili pepper and served with a creamy gorgonzola dipping sauce. I consider myself a chicken wing snob and I would order these again (we actually discussed ordering them to go for the Super Bowl last night!). Carrabba's now offers 6 small plates under $6 and I love this new concept. Many times, my friends and I will go out for drinks at Carrabba's and want something small to snack on. Our first small plate was the Italian Lettuce Wraps with wood grilled chicken tossed with vegetables and ricotta salata in a Mediterranean lemon vinaigrette. The wraps are served over romaine lettuce, drizzled with a port wine reduction. This was my favorite small plate that we tried and I will be ordering this again and again. One item removed from the menu was Carrabba's Mozzarella sticks. This broke my heart a little as this was my favorite appetizer at Carrabba's. However, let's face it - Mozzarella sticks are a little dated so Carrabba's took a new take on an old favorite with the Mozzarella Rustica. Gabe devoured them and this was his favorite small dish of the night. 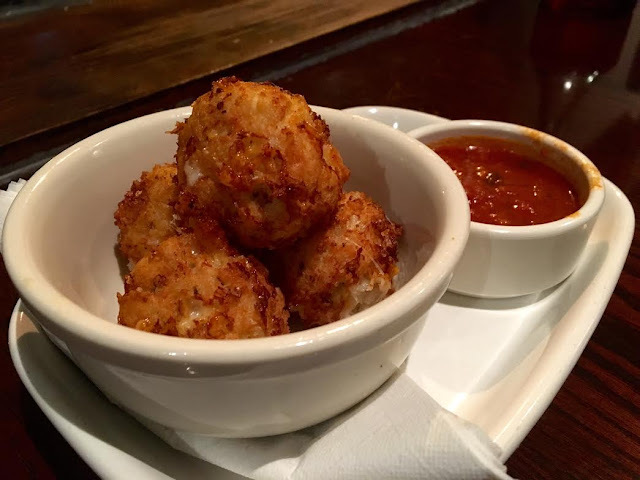 Crispy bites of mozzarella and ricotta with Italian herbs and panko breadcrumbs served with Carrabba's famous marinara sauce. I apologize for the fuzzy front mushroom. I got a new mirror-less camera for Christmas and it's a whole new learning curve coming from someone who had a DSLR for years! Back to the Mushrooms - Emmy suggested we try the Three-Cheese & Sausage stuffed mushrooms and I'm glad for this! These delicious mushrooms were stuffed with sausage, spinach, ricotta, romano, mozzarella and Italian breadcrumbs served over a tomato cream sauce. They were the perfect bite and not too filling. Carrabba's made a few updates to their House salad. Still served with a creamy Parmesan dressing, the house salad now contains carrots, shredded red cabbage, sliced radish, pepperoncini and kalamata olives. I love the added crunch of the radish and the pepperoncini brings added flavor. There are quite a few new menu items including Wood grilled Tilapia, Chianti Chicken and Cioppino to name a few. When I saw Prosciutto Wrapped Shrimp on the menu, I knew there was no other choice. I have a confession to make - I love bacon but I hate bacon wrapped anything. It's hard to get the bacon crispy enough. However, replace the bacon with Prosciutto and you do not have that problem. You still get the smokiness but with an added crunch. This is why the Prosciutto Wrapped Shrimp may be my favorite item on Carrabba's menu, ever (and I consider myself pretty knowledgeable in the world of Carrabba's food). The shrimp are wood-grilled, topped with lemon butter and served over orzo pasta with roasted tomatoes, kalamata olives, bell peppers, red onion and lemon. Served with the seasonal vegetable (I chose Spinach). 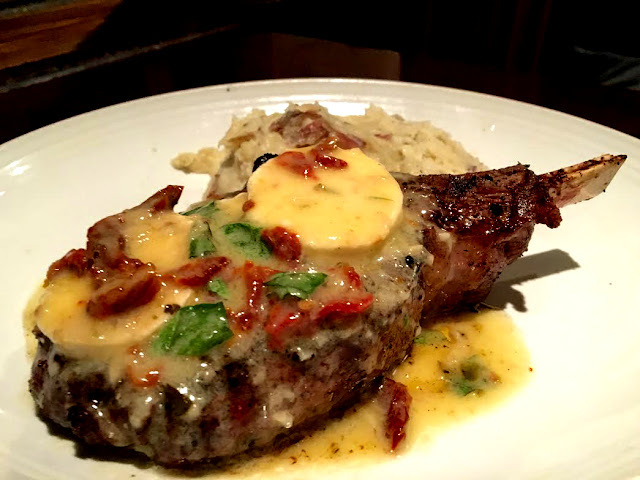 One of the new meat items is the Tuscan Grilled Veal Chop. It is a 14oz bone-in grilled to your choice piece of perfection. This is where I was blown away. I eat Chicken Bryan often (we make it at home!). However, I never in a million years thought about putting the Bryan topping (goat cheese, sun-dried tomatoes, basil and a lemon butter sauce) on a steak. Gabe loved this dish, which came with one side of your choice. Plus it was under $25 (not including the addition for the Bryan topping). A piece of meat like this anywhere else would cost way more than $25. Dessert was the last thing on my mind at this point in the meal. However, a magical word got whispered to me - Brulee Cheesecake. WHAT! Carrabba's took two of my favorite desserts and made it into one. a Creme Brulee Cheesecake topped with strawberries and a port wine reduction. I was so full but somehow finished it. Gabe tried the three new flavors of Gelato, Vanilla, Chocolate Hazelnut and Raspberry Sorbetto. Each alone were great but mixed together and it was a bit of magic. Overall I will say we truly enjoyed everything tried from the new menu and this is coming from someone who has many years experience dining at Carrabba's.